Lee Joon-seok, the captain of the sunken ferry. 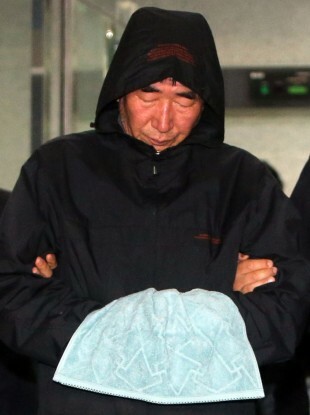 THE ARRESTED CAPTAIN of the capsized South Korean ferry has defended his decision to delay its evacuation. Divers finally gained accessed to the submerged vessel earlier today – and made the grim discovery of bodies inside. Investigators arrested Lee Joon-Seok and two of his crew early in the morning. All three have been criticised for abandoning hundreds of passengers trapped in the ferry, with 476 people, as they made their own escape. Twenty-nine people have been confirmed dead in the disaster, but 273 are still missing — most of them children on a high school holiday trip. As the arrests were being made, dive teams who had spent two days vainly battling powerful currents and near zero visibility, finally penetrated the passenger decks of the 6,825-tonne Sewol. “Civilian divers spotted three bodies through a window,” a senior coastguard officer said. “They attempted to get in and retrieve them by cracking the window, but it was too difficult,” he said in a briefing to relatives of the missing. “At the time a rescue ship had not arrived. There were also no fishing boats around for rescues, or other ships to help,” Lee said. “The currents were very strong and the water was cold at that time in the area. “I thought that passengers would be swept far away and fall into trouble if they evacuated thoughtlessly,” he added. The relatives camped out in the Jindo gym — most of the them parents of high school students — have sharply criticised the pace of the rescue operation, accusing officials of incompetence and indifference. “We don’t have much time. Many people here believe this is the last possible day for finding trapped passengers alive. “After today, hope will be gone,” Nam said. “Up until yesterday, I was still hanging on to some hope,” said Han Mi-Ok, whose teenage son was listed as missing. “But today I’m bracing myself for the worst,” she told AFP Saturday before entering the tent to providing a sample. More than 350 of those on board were students from Kang’s Danwon High School in Ansan city just south of Seoul. The unfolding tragedy was compounded by the apparent suicide Friday of the school’s vice principal, Kang Min-Kyu, who was seemingly overcome by guilt at having survived the sinking. Some experts believe a tight turn could have dislodged the heavy cargo manifest — including more than 150 vehicles — and destabilised the vessel, causing it to list heavily and then capsize. Three giant, floating cranes are now at the rescue site, but coastguard officials stressed they would not begin lifting the multi-deck ferry until they were sure there were no survivors inside. Email “Captain of capsized ferry defends delayed evacuation”. Feedback on “Captain of capsized ferry defends delayed evacuation”.